I can confirm the problem. It seems to occur because in 2007, conditional format is applied to a field, whereas in 2003, it’s applied to a range. – Set the conditional format to range covering more than the pivot table (e.g. on cell above). – When the pivot is refreshed, go to the “Conditional formatting Manage Rules…” dialog and edit the “Applies to” range. 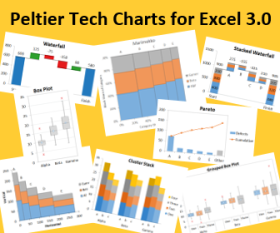 Ideally, that range would extend above the pivot table because extending below it does not avoid a complete wipe-out if the pivot table stretches too much. I cannot thank you enough for exploring this topic further. I am trying it out now on one of my workbooks, and get stuck on the part “For Each c In pt.PivotFields(“TEXT1″).DataRange.Cells”. I am trying to focus in on one of my row labels, and thought I was heading in the right direction (this is just my latest attempt, I have tried entering a few different things). Thank you again for the help!! Two errors. (1) The line Private Sub SpinButton1_Change() should not be there. (2) you have not declared nor defined pt. One of the pivot items in pivot field TEXT1 is TEXT2, right? If you focus in on cells containing the pivot item caption, you will only see the first row with that pivot item. Out of curiosity, under what conditions is this supposed to be happening? The big change to conditional formatting behavior in Excel 2007 PivotTables is that formatting is applied (to be more accurate, can be applied) to the entire column – the point being that as the data in the column is updated with new rows, CF extends to include the new rows. It makes no sense that CF should be blown away instead. Hmmm, I tried using formulas for various ranges in the PivotTable, but CF stuck every time I refreshed the table. I’ll try again later with a more complex table. I tried on two fairly simple pivot tables, and I applied the CF to the cells, not to the pivot table DataRanges. The CF remained in the rows area but was cleansed from the data area. Jon! It is working! Thank you for all of the help!!! Your posting on this topic has been a great help to me. Your examples have the subtotal and grand total rows removed from the pivot table. I want to keep the subtotal and grand total rows in my pivot table. Is there a way to conditionally format the pivot table as shown below, but leave the subtotal and grand total row formats unaffected. Say the subtotal and grand total rows are set to color index 14, with bold font prior to applying the conditional formatting. Is there a way to keep this format while conditionally formatting the rest of the pivot table? sets c to a different range, wiping out the reference to B15:H500. I think all you need to do is simply change the size of the range being formatted, reducing it by one column. In the totals (i.e., last row) you aren’t likely to have a total of 1, so I didn’t do anything to skip this row. I read your remarkable articles on this topic and must say I’m impressed with all the information you shared with us! Thank you! It’s being very helpful. However I can’t find any example using more than one row category. Even though my problem is with an externally sourced (MS Access) pivot table, I guess I could manage to solve my problem if I just could know how to determine the range for each row group. My goal would be to dynamically highlight the highest (max) value of each data column, but per row category group. In the example, I’d change the cell color of numbers 8 (Alpha,AA,BBB) and 5 (Alpha,BB,CCC) on column “a” plus 9 (Alpha,AA,CCC) and 4 (Alpha,BB,AAA) on “b”. Is a kind of dynamic ranking. How can I select each of the four three-number ranges of this example (583, 245, 709 and 412)? Is there an easy way? Are “a” and “b” separate items in a pivot field whose label doesn’t appear in your table? Or are they separate pivot fields? “a” and “b” would be like the ones in your pivot table 2 example, separate items in the pivot field “Category 3”. I haven’t included this label because this text form would make it appear even more complicated than it made. By the way, thanks for the table conversion to a much better format! :-) Just add “Category 3 ” on top of them and you complete my example table. I guess there’s a workaround that may work, but would be rather inefficient, probably. That’s using the “intersect” technique you kindly exemplified in the “Referencing Pivot Table Ranges in VBA” thread, in a nested fashion, iterating through all the Cat1/Cat2 visible label pairs. My realife table has some Cat1 values, with about two dozen Cat2 child values, with half to a dozen names under each, roughly. Cat3 is, for example, all the months of the year (12 data columns). The idea is to avoid all the pain to manually apply conditional formatting to every group of names. The final result is a categorized team ranking per month. The code does require using Intersect(), but it’s not really inefficient. I have no words for what you just did! You shed some light into my problem, and couldn´t be more responsive and complete than you were. I’m more than grateful. Later on I hope to try this code. I’ll need eventually to adapt it, as my table comes from an external Access query. Mainly use “VisibleItems” instead. I’ll post my feedback. I had finally the opportunity to evolve on top of your nice code example, adapting the data range selection technique to my data, and I must say it was a really good push towards my goal! What a splendid work you’re doing! Please keep on doing it, sharing with everybody these high quality, not easy to find, bits of information! Thank you! As I told you previously, my real world pivot table gets its data from an Access SQL query, forcing me to delve into some additional issues. But overall this problem is solved, thanks to your invaluable help! Running into another issue and would appreciate any help you can provide! My code was working fine for highlighting an entire row when I had it based on one condition only. When I try to just add in another section for a second condition (wanting the same result, the entire row highlighted) I receive an error (specifically with my End Sub). The “With ActiveSheet.PivotTables(1)” block appears twice, the second one inside the first. I made a mistake in my post earlier. I am trying to get the same format for either Name 1 or Name 2 (Sorry! I entered Name 2 twice in my previous post). Is there a way I can include this without running into that same error? Okay, I ended up getting it to work Jon! Just to follow-up on the blog, please find the code below. Thanks again for all the help!! Trying to determine if I’ve uncovered a bug, a bad install of Excell 2007, or operator error. I’m using the conditional formatting style for a series of investment returns. However, it seems that the internal calculation for one, two, or three standard is incorrect. In fact, regardless of the number of standard deviations that I select, the same number of cells get formatted. Even stranger, it only seems to occur when looking at observations below the mean. In my case, the mean is 2.55% with a standard deviation of .73% But every cell that is .77% below the mean gets highlighted regardless of the number of standard deviations is selected. I could write some VBA code to accomplish this, but would rather have the system work as advertised. You don’t provide the formulas you used in the conditional formatting conditions. I’ve also heard of problems with conditional formatting in 2007. I don’t have enough 2007 CF under my belt to know. How would you group all the BBs in one group and all the AAs in one group? I need to graph the AAs and BBs in one graph, but AAs side by side in one group and BBs side by side as a second group. 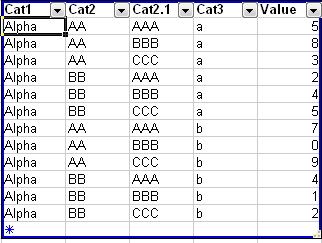 You need to switch the positions of the two fields in the row area of your pivot table, so the one with AA and BB is to the left of the one with Alpha and Beta. Thanks for the great tutorial, it has definitely helped with what I am trying to do. That said I am wondering if it was possible, using this or a similar macro to highlight based on the category name, rather then the value? For example, If I was looking to highlight the row based on the Value of BB rather then the value of the BB:a>7 Would I be able to do it? Am I calling the wrong object in this case? I’m sorry if this is an obvious answer, as I’m still very new to VBA. I am using Excel 2007 and I am looking for a way of checking if a cell is part of a pivot table subtotal line, so that I can then do something else. I am using the standard pivot table selection so there are bold lines where the subtotals are, but no actual word ‘total’ like there is if you switch it to the classic view. Do you know of anyway in which this can be done? but it doesn’t pick up anything different on a subtotal line to a normal line. Any help would be greatly recieved. PivotCellType seems broken, but you could try this. You need to define what pivot table pt refers to. Great tute! I need assistance with formatting a pivot table to match source data. Source data has rows where some account numbers are a different font color because sub-account numbers were created by the user. How can i adapt the code to format font color for pivot items that match account numbers on source data. And when I get to the Intersect line I get the following message: Run-time error ‘424’: Object required. The following code you already posted did it. The code below is running. However, I would like the comparison to be against another field called SLGoal instead of the static 0.9 that is currently being used because the SLGoal can be different for each row. Is that possible? I have three rows, one column and Count Values in my pivot table. In my value columns I have percentage format, but I would like to change the subtotal fromats to Text only. Can you help me please?